Fear no more, dev teams and R&D managers ! Use the cloud to its full potential without end-of-month spendings screwups ! 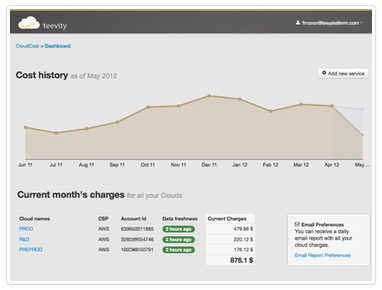 Gather all your cloud accounts under a single dashboard and get a global view of all your spending. Get awareness of where your money is going to ! How much is spent on storage, compute, Map/reduce or CDN ? We put all these figures into charts, give you a historical perspective on your costs. Define a baseline of your cost and usage, we will show a chart of the deviation. Spot any inconsistency instantly ! And yes, we're talking about a 'smart and elastic' baseline which can reflect the elasticity of 'normal' usage over time. Never forget things running or stored for no reason again ! 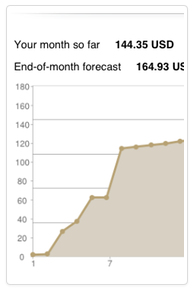 Easily spot any abnormal cost variation using the daily spend chart. 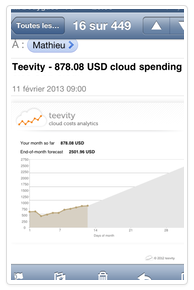 Easily push cloud cost data to the Dev of Finance teams. Enable continuous improvement. Reduce fear and complexity. 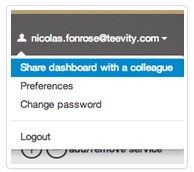 Declare cloud accounts and use the one-click sharing of the dashboard and daily email with your colleagues. One of the benefit of the Cloud is a much better ability to have a clear action-to-cost traçability. We give you ways to integrate the environment where you run your actions with our cost tracking engine so that you can make correlations. The integration of DevOps environments with cost and usage tracking enables a whole new range of possibilities for continuous cost improvement for dev and devops teams.